The Preah Vihear Temple is a Khmer Hindu temple situated atop a 525-meter cliff in the Dângrêk Mountains. The temple complex runs 800m along a north-south axis. It was built mainly during the 11th and 12th centuries during the reigns of the kings Suryavarman I (and Suryavarman II. Ownership of the temple by Cambodia has been under dispute from neighbouring Thailand. In 1962 the International Court of Justice in the Hague ruled that it belonged to Cambodia. 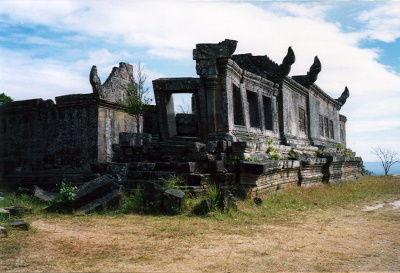 Preah Vihear is a Khmer mountain fortress about 250km from Angkor on the Thai border. From Preah Vihear you have a great view of the surrounding plains. I quickly understood why they chose the location and what purpose it served. I felt strongly reminded of other mountain fortresses, specifically Xochicalco in Mexico. Most of the site consists of ruins. The most notable structures are the naga stair case and the big temple buildings at the top of the mountain. But to me the main asset is the great view you get. While it's no Angkor, it is sufficiently distinct from it and offers a different glimpse into Khmer architecture and history. I felt it was a nice addition to my Angkor visit. Being based in Siem Reap I hired a driver for a day to take me to Preah Vihear. The driver dropped me off at the base of the mountain where the entry is located and waited for me. The original price we negotiated for the ride was 100 USD. I then extended the trip to also visit nearby Koh Ker (T) and I paid 120 USD for a full day of driving. The roads overall were good and traffic not much of an issue. You cannot go up the mountain in your own car. You have to hire a local driver to take you up either on the back of a pickup truck (groups) or on a motobike (individuals). The climb is quite steep and coming down did feel a bit risky. Tickets for the site and the ride are sold at the site entry. I am not sure if you can hike up the mountain. Probably, but it's fairly steep and the heat was hard to handle as it was. Also, although risky the ride up the mountain was fun. I would recommend going to Koh Ker if you make the effort to visit from Siem Reap. It's a 30-40km detour. Travelling on to Thailand could be difficult due to ongoing border tensions encompassing the site itself. Your best best is probably to return to Siem Reap. It's not an easy place to get to but it's worth the effort. I organised a driver from Siem Reap and that was definitely the easiest way to do it. Although there's a lot of military around, there was no hassle getting into the site. It's a really interesting site and there's a fair amount to see. A few hours is enough time to get around it all properly, though. I would definitely recommend making the side trip from Angkor to also see Preah Vihear. 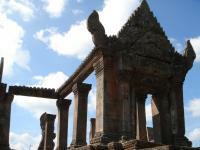 I visited the my Prasat Preah Vihear last year 2011, I never seen the temple on the top of mountain. It 's so wonderful temple, It's awesome. It 's wonder for Cambodian people who had been created by our king for many century and for worship to God Siva. It is amazing temple. 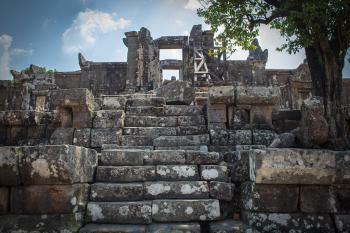 When I found out that it was possible to visit the temple on a day trip from Siem Reap, I immediately grabbed the opportunity while the site is again peaceful and accessible for tourists to see (note that this place has some serious history of crossfires by Cambodia and Thailand sides earlier). Though it is about 3 - 4 hours away from Siem Reap via rented car, I felt that this trip was totally worth it. This site never failed my towering expectations! Prasat Preah Vihear - in my opinion - rightly deserves to be on the same ranks as Angkor Wat and Bayon, if not even better. The incomparable beauty of this place stems from its (1) history (older than most in Angkor; dedicated to Siva and, according to some sources, is also one of a few that has a history of critical lingam worshiping), (2) location (situated right beside a cliff to a height of nearly 600 metres on top of the Dangrek mountains, which is within a Phra Vihan National Park of Thailand), (3) relevance (a major pilgrimage site for Khmer kings, as well as a rare key temple off-route the Angkorian Royal Road), (4) architecture (the extensive layout is very unique, the galleries surrounding the central sanctuary served as inspiration for the arrangement of Angkor Wat 300 years later, and the carvings offer a different style from that of those in Angkor - notice the style of their nagas), and (5) the struggles and controversies associated with its inscription in 2008. I personally like this place as it is not heavily trotted by tourists - thanks to its very remote location. When I went there, there were only about 5 other people visiting the place for the five hours that I was there checking everything that can be explored. Aside from the breathtaking view from the top, I truly enjoyed the experience of being blessed by monks in the sacred central sanctuary, as well as that of checking the interior of a largely ignored tower called 'The Long Haired Lady Prasat' that reminded me somehow of Ta Prohm. Also, I felt the Cambodian/Khmer pride to be greater from this site than in Angkor - this impression is best captured from a photo I got of the iconic first gopura with the three flags of UNESCO, Cambodia, and the World Heritage behind it. Prasat Preah Vihear together with its brother temple on top of Phnom Chisor in the southern province of Takeo, which I also got the chance of visiting back in 2010 with my family, will always have special places in my heart for the value and experience these two sites were able to provide. I took the service of an efficient tour guide named San Park (e-mail: sanpark.angkor@googlemail.com) who also gladly took me to several Khmer Rouge-related sites in Anlong Veng. I truly appreciated his punctuality, safe driving, and familiarity of the place and its history; hence, my strong recommendation. There is no entrance fee to the temple. But from the base office, visitors have to pay for the motorbike that will bring them to the top for a fairly reasonable price. In sum, Prasat Preah Vihear clearly and easily justified itself as being one of the best places I have seen so far. In February 2012 only a trickle of visitors were making their way to this remote site. Access from Thailand was still not available, and the site could only be approached from Kor Muy in Cambodia. Here I obtained the necessary permit to visit the site (free). Armed with this document I boarded a 4WD pick-up for the hair-raising climb up the new and almost completed road to the temple. At the top of the road I was met by Dina, an attractive tour guide who led me through the temple to the viewpoint beyond. From here the view over Cambodia was outstanding. Despite a small amount of damage caused by shelling by Thai forces last year, the displays of intricate stone carvings remain. In February the site was still heavily populated by Cambodian police and soldiers, however there were no weapons to be seen. This was perhaps the single most unique experience I have had in visiting a WHS. With a group of really good friends I made the trip in a day from Siem Reap in two chartered taxis. The site itself was rather impressive; it was a destination for pilgrims during the Angkorian period and had some fine temples drawing influence from the magnificent Banteay Srei style at Angkor. Altogether there are 4 sets of temples. The first that we encountered was perhaps the most impressive, looking a little more delicate with finely carved detailing. The final group was the largest set of temples and it was enclosed inside a nice cloister. There was a Monk located in the central temple burning incense and talking to us. Behind this final group of temples is the cliff which offers expansive views over the plains of northern Cambodia. The uniqueness of visiting the site though come from two factors, firstly it is currently a pretty remote place to get to (from the Cambodian side) but this is being drastically improved. Secondly is that the site is now essentially a Military camp, as Cambodia and Thailand have regularly escalated tensions over the sovereignty of the site, and it is now essentially a semi active ‘front line’. Due to the tense military situation in the area, and also the desire to develop tourism the road links to Preah Vihear have been greatly improved in recent months and form the look of the work going on will only seem to be getting better for some time to come. However the last stretch of the ascent is only possible in either a 4x4 pickup or on the back of a moto (perhaps only for the brave!). This was an exceptionally steep climb, and we were jostled around pretty frenetically after we piled into the back of a pick-up. Around us there were military patrols and teams carrying out mine clearance operations (this was one of the last places the Khmer Rouge retreated to). Once we reached the summit we were left in a small group of ramshackle stalls. We then proceeded to walk along the escarpment weaving between manned machine gun posts aimed out at the Thai border, and we assume that on the hills on the other side the Thai military were aiming such artillery back at us. The military presence continued throughout the temple complex with armed soldiers using it as a place to rest away from the front line. There never felt like there was any immediate danger here, and the military all seemed very friendly, however it was very odd to be on the front line of a conflict zone which occasionally becomes active. The site itself was very interesting and its location on top of a cliff makes it different from many of the other Angkorian temples. The real interest for me though was in visiting this site during a unique period in its history, when it didn’t receive many visitors and was essentially part of an active military zone. It was certainly a visit I will remember for a long time. I just came back from Cambodia last week and I visited Preah Vihear Temple and I found the temple is so beautiful; the temple is located on the beauty natural mountain. It’s hard to believe that the Khmer can bring up so many stones and built such a stunning temple on top of the mountain. The access road from Thailand to visit the Khmer temple in Cambodia still remains closed. 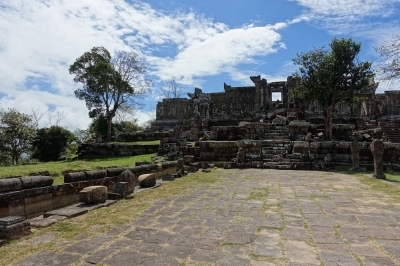 To say that there is only one easy access road from Thailand to visit Preah Vihear Temple in Cambodia is totally wrong. There are three access roads from Cambodia side. One was built by HM King Norodom Sihanouk when the King went to pay his respect to his Khmer ancestors who built the temple after the ICJ granted Preah Vihear belonging to Cambodia. Second one was built by the KR during war. Third one was built by Governor Chea Sophearath. I took King Sihanouk road because I liked to see the natural beauty of the mountain on the way up to see the beauty temple on the top. Kings built Preah Vihear Temple; Thailand wasn’t there in that time. The Khmer Kings ruled SEA when Thai people still living in Nanchao, China. Thailand sent Thai troops to invade Preah Vihear Temple and launched its rocket damaging the Giant Naga Statue at Preah Vihear Temple. Thailand never built the stone temple so Thailand can’t understand the value of the Khmer temple. I hope Thailand one day can understand the value of the Khmer temple and stop its aggression and try to live in harmony with Cambodia and let the UNESCO taking care of the Khmer temple so many people around the world can come to visit the beauty of the world heritage in Cambodia by passing from the Cambodia side or passing from the Thailand side. 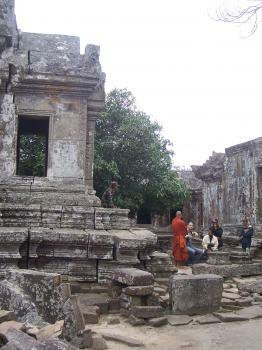 The really hot and most disputed issue in WHC 32nd session in Quebec clearly was the nomination of Preah Vihear Temple arising from the controversial judgment of International Court of Justice in 1962 and unclear border demarcation between Cambodia and Thailand. From this dispute, I believed many people might question how special of this temple to be listed as world heritage site. During my 2007 trip to Southern Laos and Northeastern Thailand, I had opportunity to visit almost all important ancient Khmer temples in this region, and I had to say that Preah Vihear was a crème de la crème of my trip. Situated on the high cliff making the temple looked quite stunning; however it was not the location that took your breath away, it was the amazing quality of stone craving of this temple that easily made this temple to be on the prestigious list of UNESCO. My guide explained that for ancient Khmer art, the stone carving style of the Temple of Banteay Srei, part of Angkor, was considered the most beautiful of its kind and there was only one place on earth that built in the same style and that was Preah Vihear, so I was not surprised why this temple was so beautiful even partial in ruins. My favorite part of the temple were the third and forth gopura halls, the third hall stone craving was exceptionally intricacy and beautiful, while the forth hall was like floating in the sky as it was built on the top of the hill. So I highly recommended visiting this temple. It was very easy to visit from Thailand side, but I heard it was quite complicate to visit from Cambodia, but try to visit it if you can; it was truly a worthwhile experience. My hope is one day Thailand will nominate its part of the temple complex to make this impressive temple to be fully completed as the idea of world heritage is to protect the outstanding work of humankind over politic and territory issue. WHC recognizes its significance and will formally inscribe in 2008 if an appropriate management plan has been developed.